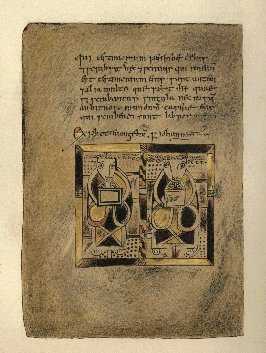 The Book of Deer is, arguably, one of the most ancient and most important treasures of Alba! 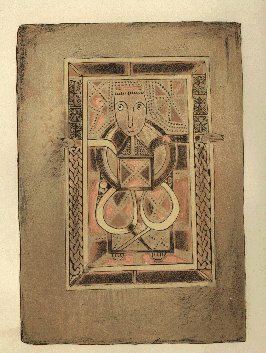 Can any true Alban sleep until it is returned to its own country? 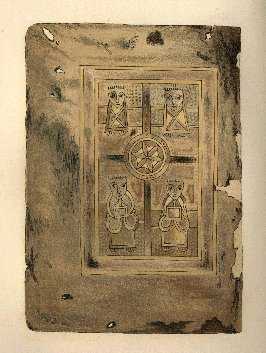 As to the book itself, its connection with the early monastery of Deer is unquestionable and more of its history is told elsewhere. 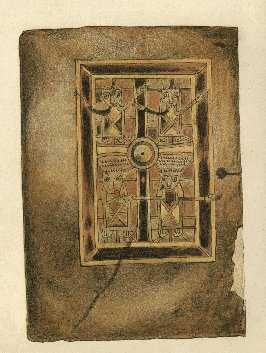 It is of a small but rather wide 8vo form of eighty-six folios (twenty of which are illustrated here). 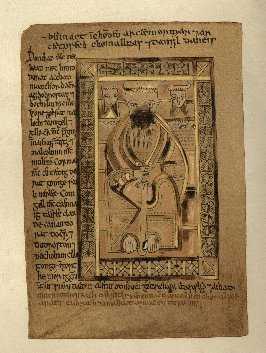 It contains the Gospel of St John and portions of the other three Gospels; a fragment of an office for the Visitation of the sick, the Apostle's Creed; and a charter of King David I to the clerics of Deer. 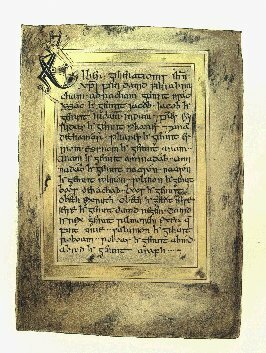 The notices in Gaelic of grants made to the monastery of Deer are written on blank pages or on the margins. 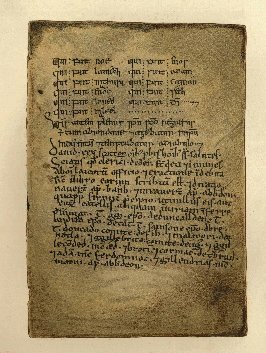 These texts are thought to be the oldest examples of Gaelic writing from Alba still to be in existence in the world - hence their pre-eminent importance to the Scottish nation! 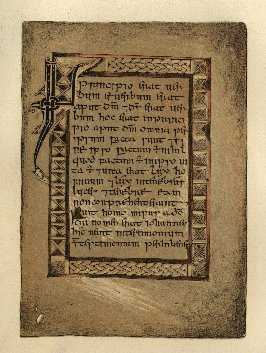 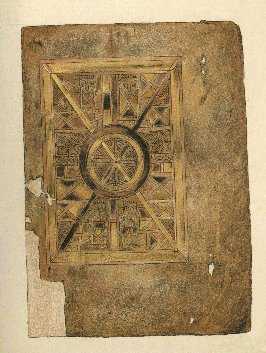 The older Gospel tracts in the Book of Deer are written in a hand which can be dated to the ninth century and is commonly thought to be that of a native (Pictish) scribe writing either at Deer itself or at one of its sister houses. 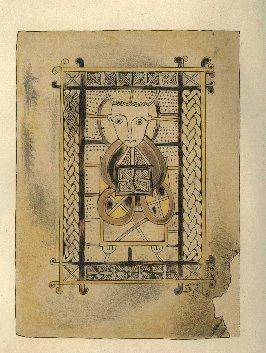 The hand shares certain similarities with other works of the Columban school. 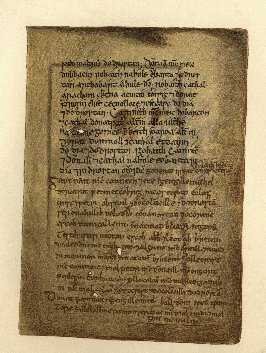 The writing of the Gospels is uniformly all in the same hand. 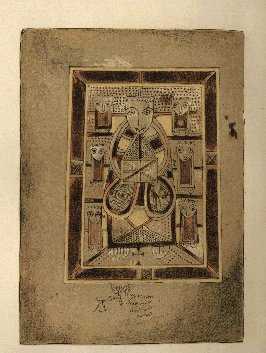 The illuminated figures have been finished with differing degrees of detail but this does not necessarily suggest different artists, it merely reflects the differing degrees of importance of the subjects of the illuminations (St John is finished with the most care). 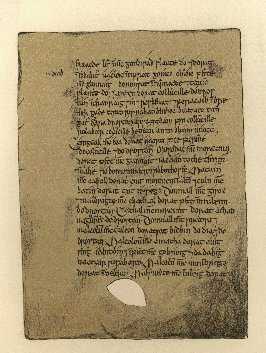 The ordinary ink is of a dark brownish colour and tolerably uniform. 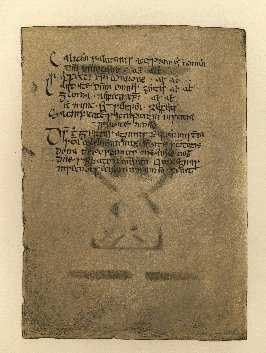 The Celtic grants show the use of a quite different ink. 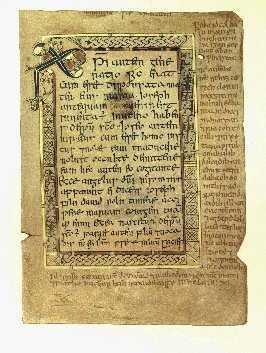 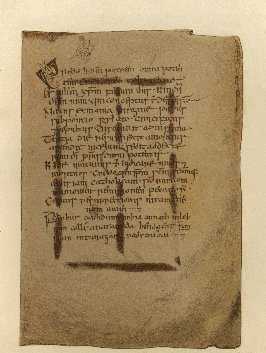 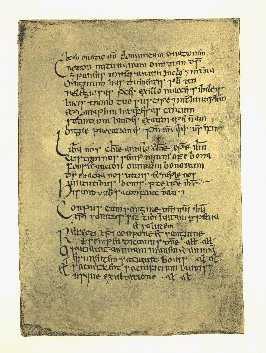 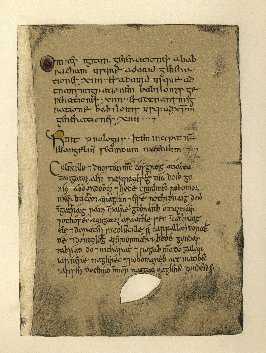 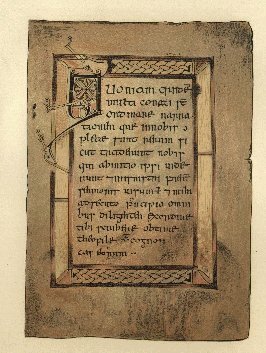 The pages generally show marks of horizontal ruled lines (see Folio 3 in particular), drawn by some sharp instrument, and the writing hangs from, instead of resting on these, a feature in which this manuscript agrees with the second part of the Book of Armagh. 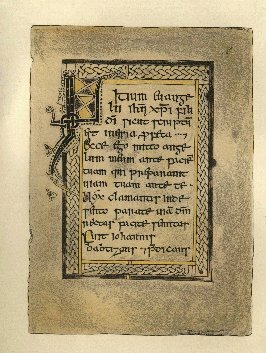 The Celtic entries in the Book of Deer are in the vernacular Gaelic of Alba in the eleventh and twelfth centuries.